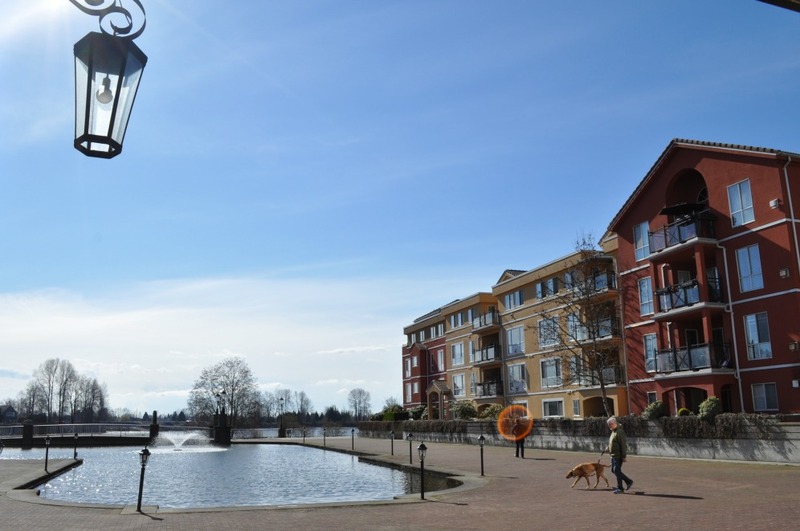 With its Riverfront Vision, the City of New Westminster is building a zone that will attract visitors from around the region, in the same way that Fort Langley and White Rock have become local destinations. 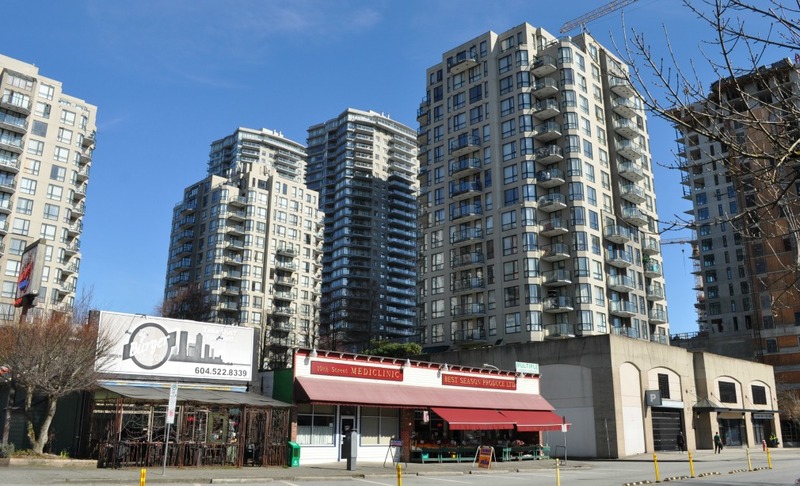 30 years after the establishment of the high-density Quayside neighbourhood, tower construction continues near the public market. This marks a new push in a 30-year-old program to transform the city’s trackside industrial waterfront. 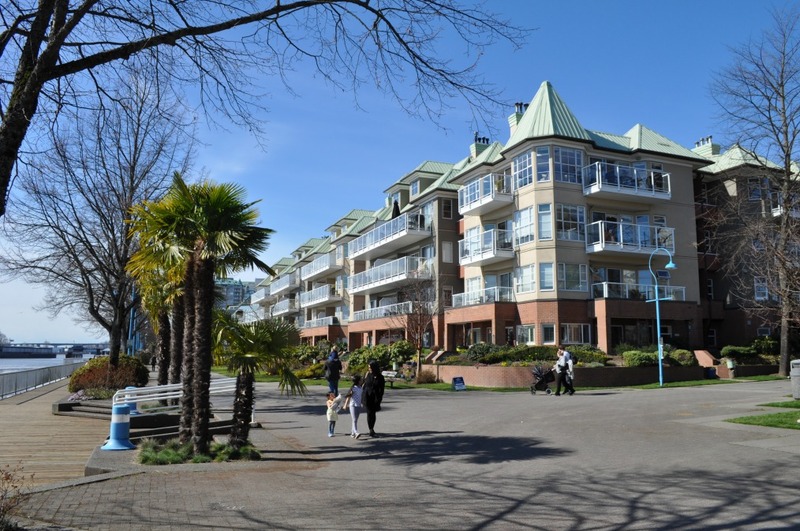 The market building at New Westminster Quay was constructed in the 1980s, on a public market model that has failed in many places (Surrey, Calgary, Robson Street in Vancouver). 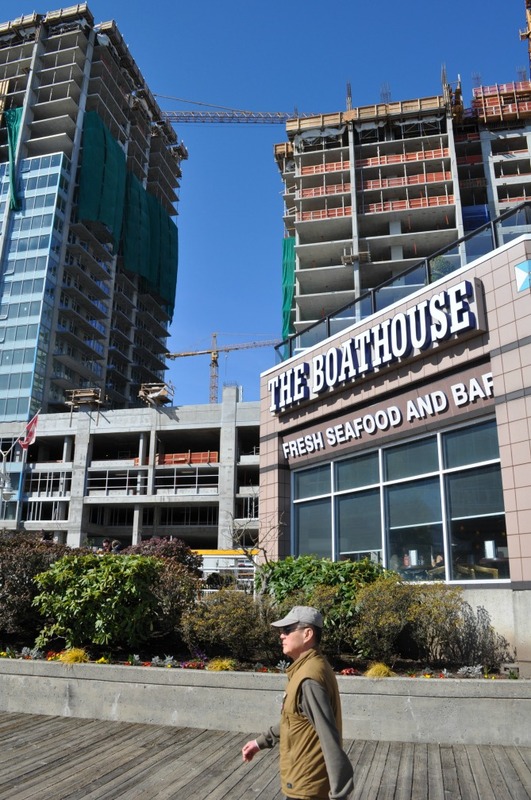 The Quay struggled for many years, but the residential densification of New West’s downtown has brought new customers, along with the conversion of part of the market building to office and meeting space. Pathways are being steadily extended east and west. 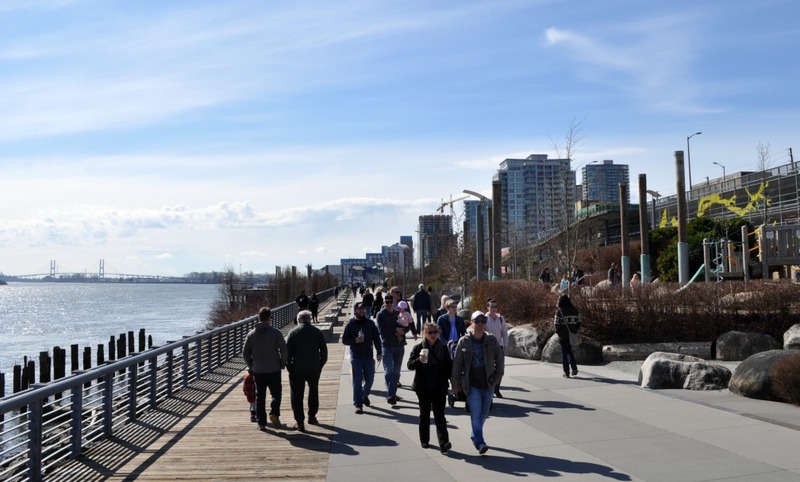 On a recent sunny Saturday, much of the 2.5 kilometres of pathway from the SkyTrain bridge to Rialto Court was busy with pedestrian traffic. Co-tourist Robert Smarz and I started our tour near the WOW, a sculpture at the eastern end of Westminster Pier Park. We noticed first that Front Street’s steel-girder parking garages, featured in countless movie chase scenes over the years, have been largely torn out. The streamlined new parkade features an elevator that drops visitors at the edge of the waterfront pathway. 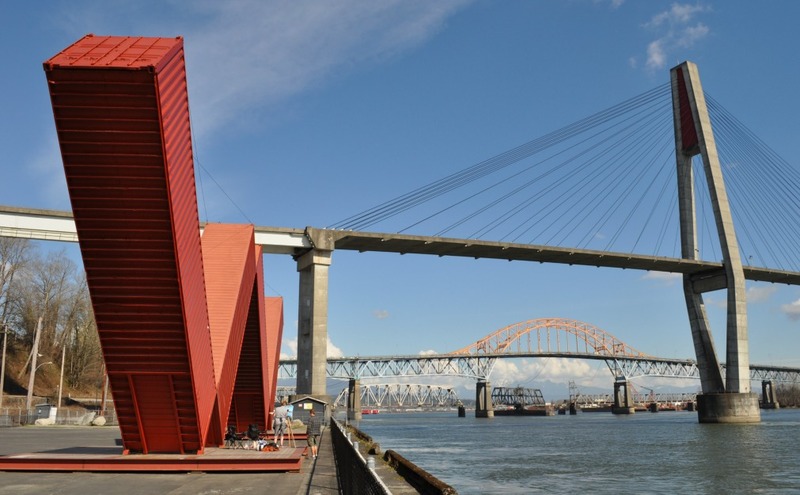 The WOW, looking toward the SkyTrain bridge and the soon-to-be-replaced Pattulo traffic bridge. Beyond Rialto Court the prettification gives out, and we returned to downtown New West via a gritty car-and-pedestrian overpass of the railway. Back on the mainland, there’s a mish-mash of decayed heritage architecture (this is British Columbia’s oldest city) and recent construction. Columbia Square Plaza, with supermarket and cafes, offers an above-average suburban-style shopping opportunity. 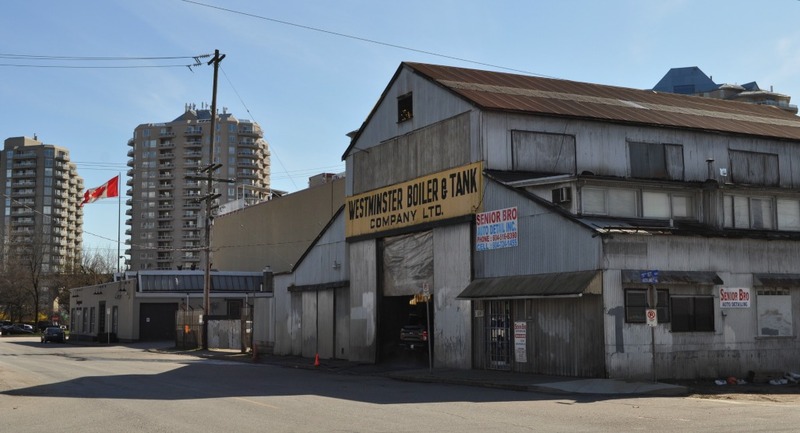 The City facilitated the development of a multi-storey shopping centre around the New Westminster Station about a decade ago. The Anvil Centre, dismissed by one visitor to this site as the ugliest building in the world, provides space for local conferences and arts activities. Finally, we come around to old Columbia Street, a classic Canadian high street dating from the 1920s and before. 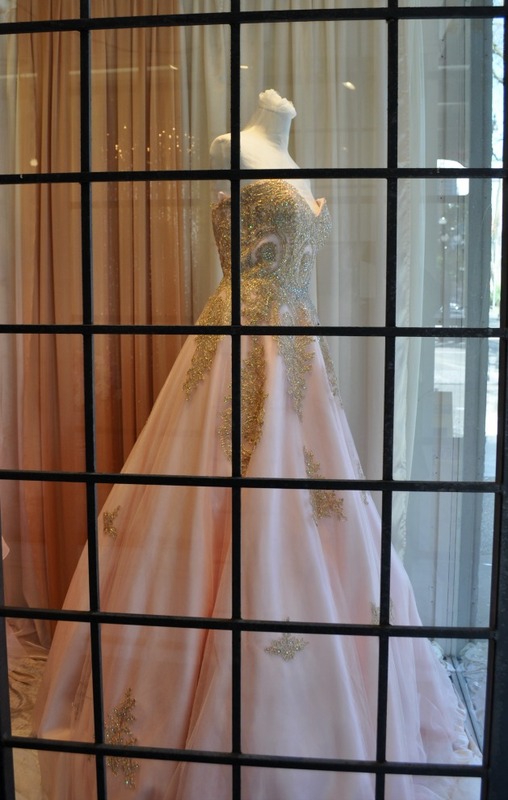 The retail use here is oddly specialized: we counted a dozen bridal wear outlets nestled around one of the region’s few surviving strip clubs. The architecture is rich, but the vibe is not. The Army and Navy, in the old Woodward’s department store building, is still selling discount gym socks and paint rollers. The Met Bar & Grill, where we had our five-dollar brunch, seems more sad and stale than it did a decade ago. 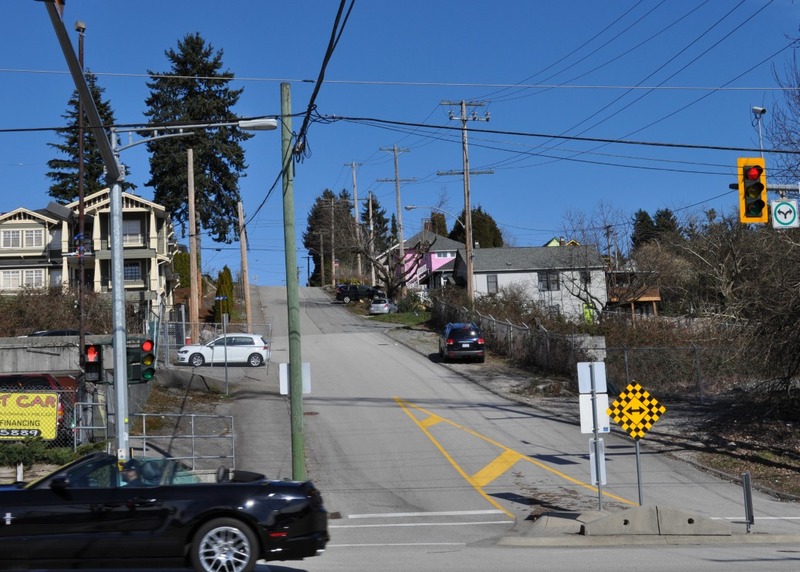 This is New Westminster, however: the new Brooklyn of Metro Vancouver, home to young working people, neatly placed for a quick commute to less-interesting Surrey or Metrotown. Columbia Street will turn quickly when it turns.